What we should probably do is go and split up investment banking from banking, have banks be deposit takers, have banks make commercial loans and real estate loans, have banks do something that’s not going to risk the taxpayer dollars, that’s not too big to fail. I’m suggesting that they be broken up so that the taxpayer will never be at risk, the depositors won’t be at risk, the leverage of the banks will be something reasonable. Who knows? It’s actually not all that uncommon for elder statesmen who are no longer running things to have a change of heart, and it seems likely that’s what’s happened here. And like other similar U-turns, it probably won’t have any impact at all. Nonetheless, it’s pretty intriguing. 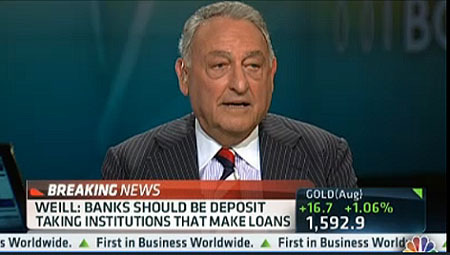 When even Sandy Weill thinks banks have gotten too big to fail, is there anyone left to disagree?